Hey guys! Some of you might not know about this thing I’m passionate about and I didn’t want you to miss out. For those of you who don’t know, I volunteer with some friends at the city jail once a week in their library service. What that means, is that we select books off the shelves, organize them on book carts and drive them from cell block to cell block. 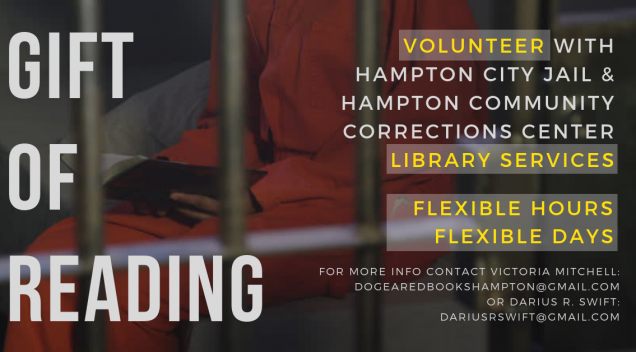 We allow the inmates to “check out” books and fellowship with them in the process. It is truly a win-win situation. They are THRILLED y’all. AND it’s seriously the most rewarding thing I experience all week. Some of them don’t get any visitors and they look forward to seeing us when it’s their turn on the schedule. And they LOVE the opportunity for reading material. Speaking of reading material that’s well loved … They’re only allowed paperbacks in their facility, and paperbacks have a finite “shelf life,” pun intended. What that means is that the books need to be replenished often. They are very well loved and appreciated, and so they are shared from inmate to inmate within the block until we come back around to them with the cart again. And then they’re turned in to be loved some more by a new group. Y’all the books are loved to tatters. I know you want to help, so here’s how. It would be AWESOME if you have a heart to come out and volunteer with us and I promise the most fun and meaningful service act you may have ever experienced. We do not have enough volunteers to serve our mission the way we would like. If you think you might be interested, hit me up on email at dogearedbookshampton@gmail.com. But, if that’s not your thing you can still help out! Since the books do wear out after a while, and we serve a large population, we are ALWAYS in need of more paperback books. Those we serve have a diverse and eclectic taste so you really can’t go wrong, but, there are always some big hitters that we look for especially. If you come across any self improvement or how too books, even old textbooks that are paperback are a great bet. Dictionaries are actually the most requested item. For fiction they all love James Patterson! And they also really like other similar books in that genre like David Baldacci, Harlan Coben, Lee Child, Dean Koontz, Steven King, Brad Thor etc. There is an abundance of Christian literature that is provided from several sources. We are not accepting books of that kind at this time. Dog Eared Books is a collection point for donations to the program. If you have paperbacks you would like to donate, they will be very appreciated where they’re going. I’m sure you have questions I haven’t answered, but Darius and I tried to answer most of them in this short video you can watch here. Also, please be awesome and help get the word out by sharing this post? Thanks a million!